That opportunity came along lately when we were asked to work on a bespoke product – a set of industrial rubber pads for steel pipes. One day, the Aquaseal’s sales team received an email with the subject line: Can You Help! That had us curious and a bit excited about what the client could be looking for. After opening the email and reading the content we realised that this was a great opportunity to work on a bespoke project for a client. The client had provided us with drawings so we set to making the item requested clear in our heads. Our team studied the drawings and after a few emails back and forth with the customer we were able to make some recommendations for the product. As we learned the product is going to be used outside, we suggested a multi hardness solution. The base of the pad is black EPDM 70 shore hardness and the top face is 40 shore abrasive resistant natural rubber BS1154 Y2. Both materials stand up to degradation outdoors in the sunshine. The EPDM is resistant to ozone and UV while the Natural maintains grip in both low and high temperatures. The natural BS1154 was made thinner on the blocks so they would not to be damaged by the ozone and sunshine while in use. 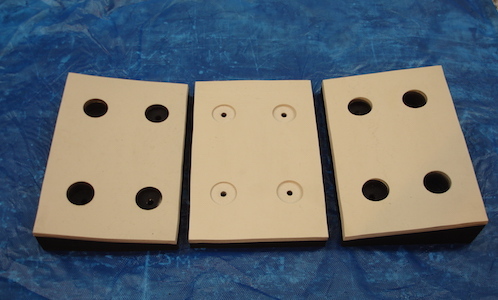 The reason behind the dual hardness is the application of the rubber pads. They are acting together as a clamp for lifting and holding a steel pipe structure while work is carried out below the large pipe sections. This level of hardness was required so the bolting system would hold and the softer hardness material would grip and flex the steel structure. We also advised that covering the blocks when not in use would prolong the life expectancy of them. Aquaseal have completed the first 4 sets of the pads for testing and they’re on their way to site in Spain. This was another challenging and rewarding project to work on. We worked with the client to ask the right questions, which resulted in them getting a product that meets their needs beyond a traditional rubber product. We will post an update on the testing once it’s been completed.